You know, I thought I had a pretty cool name until I put all my initials together and they spelt D.A.W. As in 'door', 'duh' and 'dawg'. So I keep it at Dan. 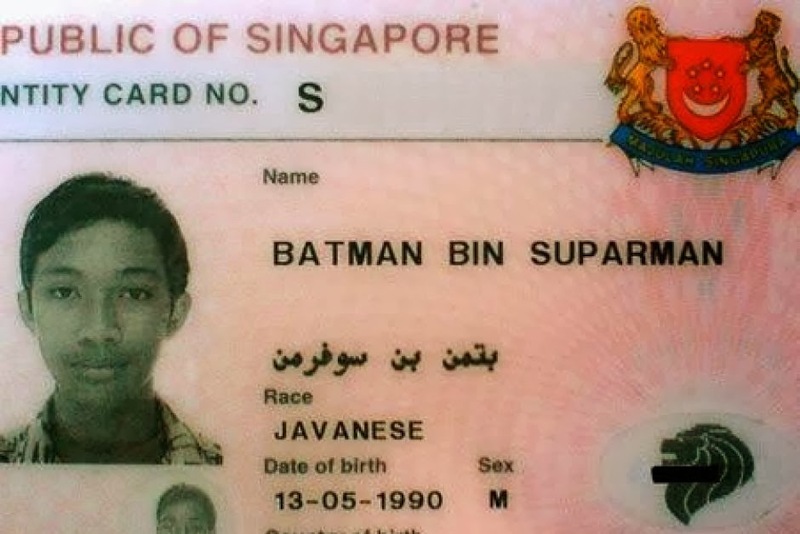 However, one guy recently arrested in Singapore has the actual name of Batman Bin Suparman, which really could only be cooler if his middle name was changed to 'Bee-Ting'. The 23-year old's crimes? Stealing his brother's ATM card to withdraw money, breaking into a business to steal more money, and use of heroin, revealed through a test of his super-bat-urine. While all good fans know neither Clark nor Bruce actually have any brothers, and would never put the title of 'hero win' on any person turning to theft, this pretender to the throne has over 10,000 likes on his Facebook club. Hopefully one of them can help encourage him to do better things with his life, if he isn't too busy hanging like a bat from the prison shower roofs, afraid of the 'kryptonite' below, to listen. What a prick! Having a name like that! I suppose when youre eight years old that seems kinda cool but howd he eveer expect to get a job/girlfriend/life with a name like that?. I used to be a social worker before becoming a prison officer and believe me hed need kryptonite if he ever turned up in the showers with THAT name[!]. Some people need saving from themselves, don't they. They sure do Karl, but you are right too, I mean how can you get a job with that name. Imagine Telemarketing... "Good afternoon Sir, I'm calling on behalf of Amway. My name is Batman Bin Suparman (click) beep beep beep "
i just heard about this on the radio this morning. it's kinda funny and sad at the same time. by the way mate glad you liked my recent find for the Squad blog. speaking of fan art how's yours coming along? didn't you say you'd have it done by now? Thanks Dave - I'm doing version two. My Bronze Tiger looked like he needed to be put out of his misery so I'm redrawing. Promise as soon as i'm done you'll get it mate. Dale, you can still use that name if you wanna. We could all adopt two and form a Justice League of sorts. That way we won't have to chose between favourites. Just call me Hawkman bin John Stewart from this point forward. Maybe this is where he reforms himself and dedicates his life to fight crime? That name is too cool for him to waste. Only a comic fan can believe in reform like we do Random!